What we’ve got here is a financial management app for the 21st Century, offering entrepreneurs and business owners a streamlined way of managing every aspect of their time, money, clients, and much, much more. I’ve reviewed more accounting and miscellaneous money management apps than I care to think about since I started writing for App Picker, but this is almost certainly the first one that I’ve come across that really resonates with me. Having been involved in a couple of startup projects with entrepreneur friends of mine, I know how important it can be to keep on top of everything, and I definitely think that an app like this could really help a lot of you quite profoundly. FreshBooks Cloud Accounting is a money management app that has been designed with business owners in mind rather than experienced accountants, but don’t be fooled into thinking that this app is overly simplistic because it really isn’t. Instead what we have is a superbly streamlined and user-friendly interface neatly filled with all kinds of features that enable you to track your working hours, send invoices to clients, and even receive payments via online services such as PayPal, or via credit card, echeck, and many more. As well as keeping track of your income you can also use this app to monitor your expenses by snapping photographic scans of your receipts before sorting them into the appropriate categories to keep things nice and organized. I’m also very pleased to see that the developer has gone so far as to offer a customer service hotline that you guys can call if you experience any difficulties or get stuck with any of the features. This isn’t very common amongst developers so this is a great thing to see! 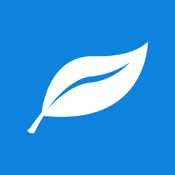 FreshBooks Cloud Accounting is a very, very solid addition to the Finance category of the App Store, and is a must-have iPhone and iPad app for any budding entrepreneur.